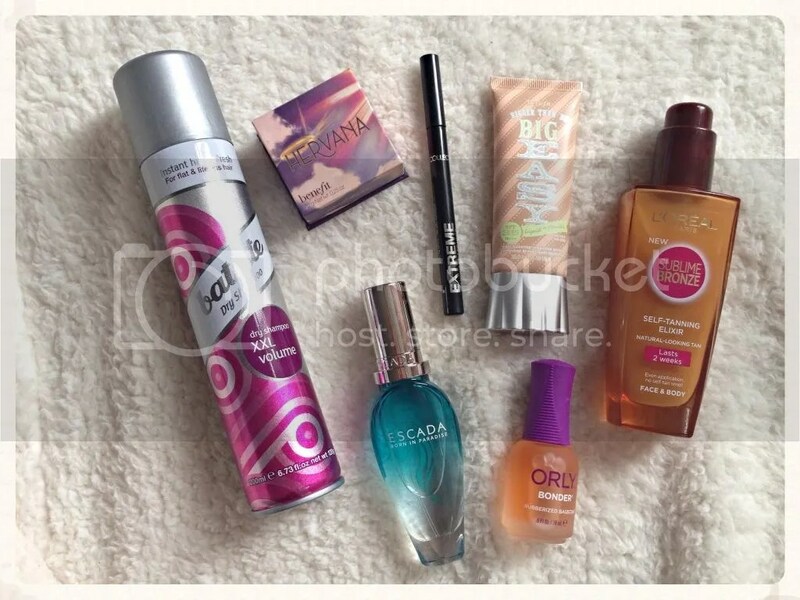 April Favourites! | Becky Alyssa's Beauty Box. Hey all! It’s just over 2 weeks until my Final Major Project hand-in (*cue scream of terror*) – it’s sad how work seems to creep up on you until you realise you’ve hardly seen friends or written a blog post for weeks! I can’t wait for hand-in on the 16th May so my life can get back to normal again. This month I managed to fit in a wonderful trip to Amsterdam with my lovely cousins, a trip I’ll never forget – I’m so glad I took a break from the stress to get away with them for a few days! However work has hardly diminished my love for fabulous beauty and makeup bits, and I’ve been so excited to finally show you what I’ve been loving this April! 1. Batiste XXL Volume Dry Shampoo (£3.99 via Superdrug) – I’m amazed I haven’t shared this fabulous product before! Some type of hair oil-absorbing product for me is a must since I try to only wash my hair every 4-5 days to keep it healthy. I don’t always use Batiste and often just use baby powder instead since my asthmatic lungs don’t tend to agree with aerosol products, but this particular Batiste is ideal for a few sprays in the crown area to give a lovely boost of volume on top of any other dry shampoo product. I’ve just finished my first can and have now moved on to my second. Ideal for anyone with flat hair like myself who could do with a volume injection for 2nd-day hair – this stuff really works! 2. Benefit Hervana Blush (£23.50 via Feel Unique) – I’d been wanting to try this gorgeous blush for ages and I decided to just go ahead and treat myself this month! Have you SEEN the inside?! Stunning. Admittedly I did have a Feel Unique discount code and also got a free tiny Stay Flawless primer with it for free, so it was an even better deal. It isn’t always easy to go ahead and just buy a ‘high end’ product when you’re on a budget, but sometimes it’s definitely called for – I highly recommend running a quick Google search for discount codes beforehand as well, or even asking for student discount promotions in store – I’ve saved quite a bit this way over just the last week or so! Anyway, back to the blush! I use this swirled together with a fluffy face brush for a pretty, natural-looking flush that’s hard to over-do. I find this does wear off by the end of the day, but it’s such a lovely shade that’s easy to wear. Like all Benefit box blushes, the powder is lightly scented (this one smells like grapes/berries to me), but it doesn’t linger on the skin. One I’ll continue to stick with for a while. Glad I convinced myself to get it! 3. Collection 2000 Extreme 24h Felt Tip Liner (£2.99 via Boots.com) – I’m in the midst of a liquid liner love affair. After my Eyeko Skinny Liquid Eyeliner dried up after only around 6 weeks of use, I couldn’t quite justify paying £12 for a new one. I’d read some good reviews for the Collection liner, so decided to pick it up in Tesco – who can say no to a raved-about product for just under £3? And surprisingly, I actually prefer this to the Eyeko liner. I’ve been using it for a few weeks already and it still remains super-dark and pigmented, whilst giving a very precise line despite my shaky hands and sensitive lids. The only issue I have is that it does smell like Sharpie markers when the lid is off, but other than that it’s been nothing but brilliant! 4. Benefit Big Easy Multi-Balancing Complexion Perfector in Light (£27.50 via Feel Unique) – April is truly shaping up to be the Month of Benefit – I seldom use Benefit products, but here we have two of them together! At first I felt this was nothing more than yet another gimmicky BB/CC product, but after trying out a sample in Debenhams I was well and truly proved wrong. I highly recommend it for anyone with severely oily skin like myself – it stayed matte and natural-looking for the entire day! Most base products leave my skin an oily mess after just a few hours. This is truly magic, no doubt. Not to mention the SPF 35 – I’d still want to use an additional sunscreen product if I was out in the sun for a long period, but it’s pretty impressive for a product of this type. I can’t wait for some sunnier weather so I can try this out some more. It’s absolutely worth trying out a sample before buying as the shade range leans fairly pale – I’m a NW20 in MAC and have Shade 2 out of 6, but after trying shade 3 at first, turns out that would suit me just fine as well. 5. L’Oreal Sublime Bronze Self-Tanning Elixir (£10.66 via Tesco) – I managed to pick this up on offer in Superdrug and ended up paying just £9 after student discount. After seeing Vivianna Does Makeup’s positive review of this, I had to try it out myself too! Confession: I’d never used a self-tanning product before. They conjured up images of streaky Oompa-Loompa-esque legs on girls I used to go to school with, but it seems self-tanning products have come a long way in the last 10 years. After applying a thin layer of the lightly scented translucent white lotion wherever you fancy looking a bit more tanned, simply leave on overnight and wake up to a gently sunkissed, natural-looking tan the next day. The bottle recommends applying up to 3 layers over 3 consecutive days, but 2 applications was plenty to give my pale skin a natural-looking tan for nearly 2 weeks, as if I’d spent a few days somewhere considerably more tropical. I only used this on my arms and legs at first, but this can be used all-over, including on the face and chest. Very impressive, coming from someone who’s normally scared of tanning products – no doubt I’ll be using this all up! 6. Escada Born In Paradise (£19.99 for 30ml via Fragrance Direct) – April was also the month I first owned an Escada fragrance! My mum was lovely enough to buy this for me after I spent the day out shopping for skincare for her. It was definitely an impulse choice, though I was hooked from the first sniff. It is described as “pineapple, coconut milk, watermelon and green apple”. The fruity, coconutty scent reminds me of tropical beaches and makes me so very excited for summer weather! I’ve already used up quite a lot of my 30ml bottle and will be sure to pick up a larger one before this limited edition scent is discontinued. 7. Orly Bonder Rubberized Basecoat (£10.90 via LookFantastic) – I’d given up wearing nail polish for a while since it just seemed to chip or peel just a day or two later. I finally decided to invest in a decent base coat for once, and I’m very glad I did! Orly Bonder comes in a bottle with a very cool rubber lid and only needs to be applied as a single base coat under your polish. I tried it out with Essie’s ‘A Splash of Grenadine’, one of my favourites from last month, and it lasted a good few days longer than it normally would and felt extra-resistant to chipping and peeling. I’m giving my nails a break for a while since they were in quite poor condition, but I’ll be sure to use this every time I paint my nails from now on. Hope you enjoyed my April favourites! What have you been loving this month, beauty-themed or otherwise? Now excuse me while I go write a 2000 word marketing report! Hervana is really beautiful and I lust after it every time I see that beautiful pinwheel! I really need to pick it up someday!